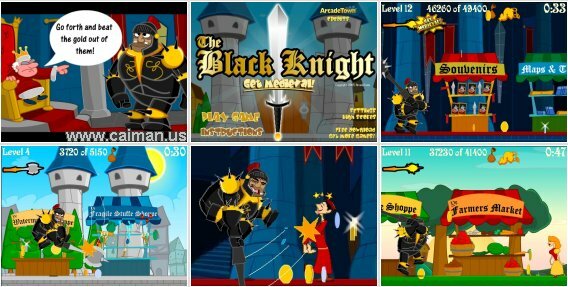 Caiman free games: The Black Knight by AltoParc Solutions. The peasants have hidden all their gold from the king. Hit them to get it back! The harder you hit, the more you'll get. Just don't hit Matilda the witch! She hates to pay taxes and will turn you into a pig if you mess with her. Between the levels you can buy better weapons and other items. 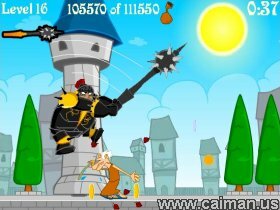 - Lucky Medaillion gets you more gold with every swing. - To hit the first person or item I click with the left mouse button and HOLD it down. By the second person or item I released the button which causes a Medieval (is a stronger attack). - Try to buy as soon as possible the heaviest weapon.